Cultural Masonic Centre ‘Prins Frederik’ in The Hague, The Netherlands. Freemasonry in The Netherlands has always been relatively modest in terms of size and quantity, but exceptionally rich in quality and content. 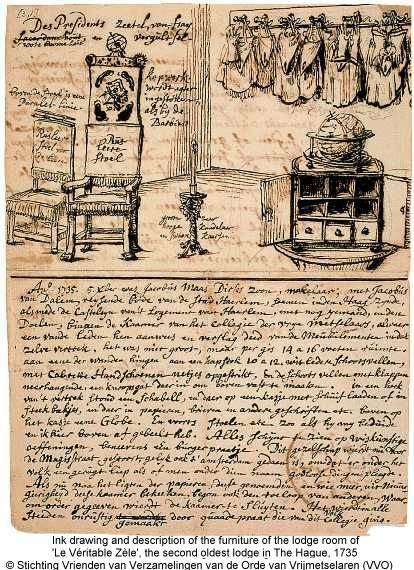 It is ancient: the oldest known lodge on the continent of Europe appears in Rotterdam, 1721, hardly four years after the London genesis of 1717. 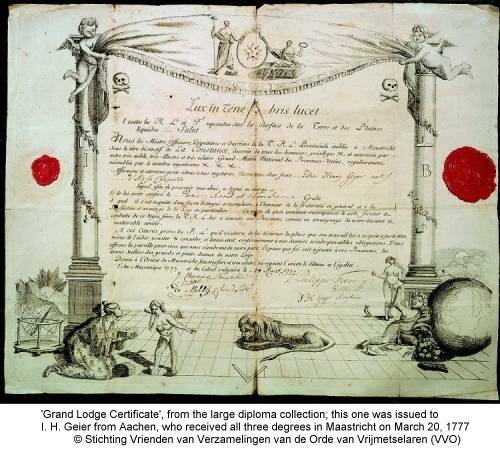 The national Grand Lodge, styled Grand East of the Netherlands, has adopted 1756 for its year of foundation, but has in fact existed continuously since 1735. It has been more fortunate than many other Grand Lodges in that it has never been seriously plagued or torn by controversy and schism. Although it has developed its own distinct style, it has in fact, through the ages, been a steadfast paragon of regular Freemasonry. One of its assets is the possession of extensive collections in its archives, library and museum. In order to house these the Grand East has set up a separate institution, the Cultural Masonic Centre ‘Prince Frederick’, CMC for short. This CMC features a Reading Room where visitors may inspect and study documents and books, and an Exposition Room which is meant to give an impression of the extraordinary object collection we own. The CMC staff work daily to create easy and full access to these vast collections for all those interested. The library catalogue, which can be consulted on-line now, already comprises all books and manuscripts and will be extended to register journals and other masonic periodicals. This means that one of the finest masonic libraries in the world now allows swift searching with maximum results. For over half a century now, it has been the policy of the Grand East to allow anyone who wishes to study aspects of Freemasonry to come and see for themselves. There is no secrecy here. In a few years the archives, which extend back far into the 18th century, will have a computerized inventory for all to consult. By exposing our treasures to the world, we find we help create a more general awareness of the unique cultural heritage that Freemasonry has contributed to the civilized world, and of its enduring value as a force for good. The archives can be distinguished in several chief constituents. The archives of the Grand East consists of the documents of the Grand Lodge 'legislative' council, which is the Grand East, strictly speaking. Together with annexes and offshoots, this series of files really form the core of our archives, running from 1756 up to the present. Moreover, we have the archives of some 80 lodges that were discontinued over the years - the Dutch East Indies lodges form a notable proportion of these -, in addition to the early archives of some still existing lodges. As a separate collection, we refer to these as the deposited archives. They include a great variety of documents, throwing light on, for instance, the role of a lodge in local society, but often also on that society itself. Researchers are not only attracted by the minutes of meetings, but also by the so-called visitors'-books and, obviously, the membership register and charts. The nucleus of the CMC Library is still the bibliotheca Klossiana, consisting of the famous Kloss collection with its many extremely rare or unique titles. Often researchers come from far and wide to refer to its books and manuscripts. Here, and only here, you can trace much of the history of masonic rituals, especially in the fabulous manuscript collection. But in fact all subjects related or belonging to freemasonry can be found here: the unresolved 'prehistory' and the origins of the Craft, the alleged connections with cathedral builders, Rosicrucians or Knights Templar; alchemy, antique mysteries, the Illuminates who caused so much controversy towards the end of the 18th century, and so on, and so forth. In other words, there is hardly any area or side issue not documented by Kloss. Borrowing books is only possible to a very limited extent, which is understandable in view of the large number of old, rare and precious works. Obviously, journals and records from the archives are not lent out at all. In many cases it will therefore be necessary to come and look at books and documents in the Reading Room which, incidentally includes a very well stocked reference library. 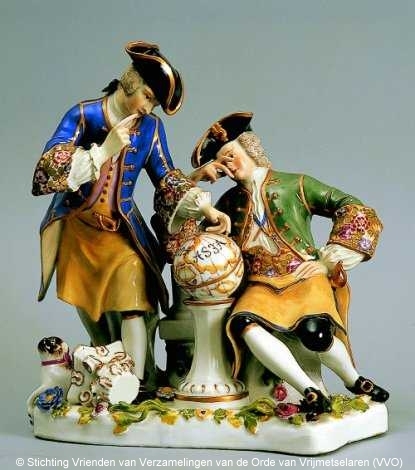 The Museum developed from a 19th century collection of commemorative pieces such as were, and still are, usually presented on the occasion of anniversaries and celebrations: medals, goblets, decorative plates and the like. Nevertheless, however rich the medal collection may be, nowadays the emphasis of the museum has shifted to other things. We try to apply our varied collections to throwing special light on the practice of Freemasonry in all its variations throughout the centuries. That's why the masons' tools and other objects, 'Ornaments, Furniture and Jewels' in masonic parlance, form an important category of objects. 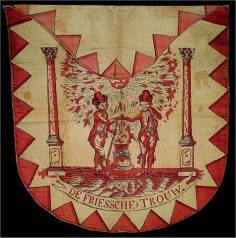 Among these are the personal attributes needed or worn by freemasons in the course of the rituals they perform. For instance, they symbolically wear the clothing of the stone mason of old, an apron and gloves. an Entered Apprentice (or Fellow Craft?) receives instruction from a Master Mason.